Treat your dog to the golden little treats that go crunch! Milk-Bone Dog Treats are made with real bone marrow, the great tasting part of the bone your dog craves. Reward your dog with the delicious meaty taste he finds so irresistible! 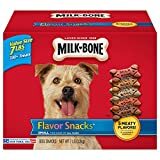 Milk-Bone Mar-O-Snacks are a wholesome, meaty treat with real bacon and crunchy bone marrow that’ll leave your dog’s mouth watering for more.